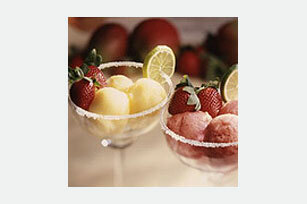 Puréed strawberries, lime juice and a touch of tequila flavor this refreshing frozen dessert. Serve in stemmed glasses for a special presentation. Mix gelatine and sugar in medium saucepan. Stir in water; let stand 1 minute. Cook on low heat 5 minutes or until gelatine is completely dissolved. Remove from heat; stir in remaining ingredients. Pour into 9-inch square pan. Freeze 3 hours or until firm. Remove from freezer; let stand at room temperature 10 minutes or until slightly softened. Place in large bowl. Beat with electric mixer on low speed 30 seconds. Beat on high speed 2 minutes or until smooth and creamy. Return to pan; freeze until firm. Remove from freezer about 15 minutes before ready to serve. Let stand at room temperature until slightly softened. Spoon into dessert dishes or stemmed glasses. Garnish with fresh fruit. Sugar rims of glassware before filling with sorbet. Prepare as directed, substituting 1-1/2 cups chopped mango, pureed (about 1 cup) for strawberries and increasing lime juice to 1/3 cup.